Do you believe in second chances? I do, especially when it comes to the clothing that I wear. My love for thrift stores and consignment shops runs so deep that I can barely see what is in my closet ('cause most of the items are still packed in fancy polka dot boxes). Over this past year, I have been hugging my heart with amazing pieces found on "the largest online consignment & thrift shop" – thredUP! Somehow, my passion spilled over tremendously through my social media channels and alerted the wonderful people at thredUP, who in turn invited me to become an ambassador for their awesome company. It took me a whole 4,5 seconds to accept their offer. So, what does it mean to be a +thredUP ambassador? Well, for the most part, I am just doing what I was doing before I added the title of "ambassador" to my name. It was such an organic partnership; it made perfect sense to represent a brand that I was already so in love with. The only difference is that now you will see more sharing on my social media channels about the great findings on thredUP. I will even share some pins on Pinterest and point you to some of the hottest items (that usually don't last long after I share them). I should let you know that all of this hard "work" does not go without compensation. As a 'thank you' for being cheerleaders for thredUP, each ambassador receives monthly credits and a special discount code to share with immediate family members. Over the course of this program, which runs for the entire year, ambassadors will also host events and parties in an effort to promote thredUP and encourage others to clean out their closets. This brings me to another great benefit of joining thredUP: selling your unwanted, gently used items for CA$H. Currently, thredUP is accepting Spring wardrobe pieces like dresses (especially maxis), sandals, and light layering pieces (denim jackets, light sweaters/cardigans, etc.). Always check the to see what is acceptable to send in. For those items that are clogging your closet, collecting dust (do clean them first before sending in) or were impulsive buys, get rid of them. The worst thing that can happen is you'll make some money or have your unaccepted items donated to a charitable cause. If you don't want to part with your items, thredUP even has a feature that will return your unaccepted items back, for a fee. It's a win-win situation. Since having a baby in 2013, a lot has changed. Gone are the days where I can just jet out of the house, get in the car and go. Now, I have to get a sippy cup, change a diaper, pack a bag and possibly remove a stain from my clothing before I can even make it to the door. I'm beat before I even reach my destination, which is part of the reason why I rarely leave the house anymore. thredUP makes it convenient for me to find fashionable and affordable pieces online without having to step foot outside. Check out my great Colin Stuart boots (Victoria's Secret) that I scored on thredUP for $11.49 (see pic below). They make it easy for me to spruce up a casual get-up so that I don't fall into the trap of dressing like a frazzled mother. I literally put this outfit together in 5 minutes. I know that my postmaster is probably overwhelmed with the amount of polka dot boxes that have made it's way to the front step over the last few weeks. I just cannot help myself. Some of these deals are just too good to pass up on. The thredUP app gets the most usage on my phone, even it's just for fashion inspiration or to see what trends are out there. Are you curious to give it a try? Well, here is a free $10 credit to thredUP if you go here. It will be applied to your cart once you sign up. I guarantee you there will be something for you...or a friend. In no time, thredUP will have you reaching new heights in the fashion game. Go ahead, give clothing a second chance. 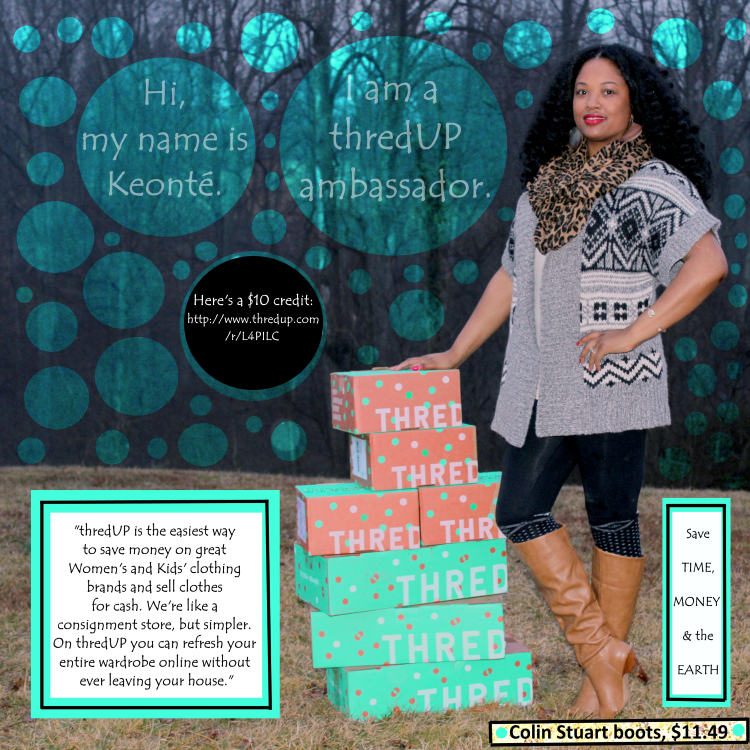 I am an ambassador for thredUP Inc. For my participation in this program, I am given credits to shop their site. Some of the links in this post are referral links and will possibly give me credit if you choose to use them. All opinions and views are my own.